The 8th Edition of the Sansad Ratna Awards 2017 and the 6th Edition of the National Seminar on Politics, Democracy and Governance was held in the prestigious IIT Madras campus on Saturday, May 27th, 2017. It was a day-long event of presentation lectures, awards and panel discussions, interspersed with addresses by eminent dignitaries to the function. The morning started early with people filing in for registration at least an hour before the commencement of the event. Before the first item of the day’s programme was due, the auditorium was fast filling up with people from different academic and professional backgrounds. The stage was set for the first presentation by Shri M R Madhavan, President of PRS Legislative Research, Delhi. He made an hour-long interactive presentation on “Making the Indian Parliament More Effective”. He concluded the session, proposing some ideas for deliberation to make better sense of governance by the Parliament. 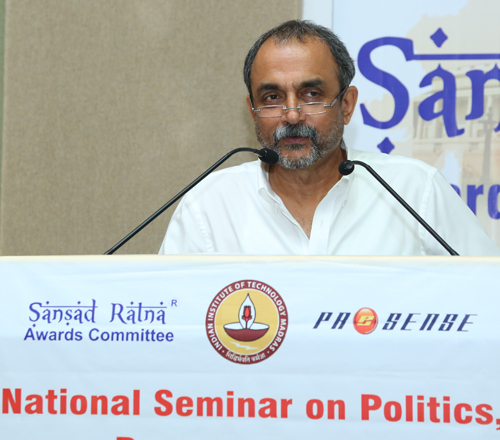 The second one-hour presentation was by Shri Mukund Padmanabhan, Editor of the prestigious daily newspaper, The Hindu. He spoke about the current and much speculated topic of “Journalism: New Challenges and Threats”. The prime point of the event was the session that followed – The Sansad Ratna Awards 2017 function. The front row of the audience section of the auditorium was already decorated with the presence of Parliamentarians from across the country and across all main political parties. They were the award-winning candidates for their top performance in the just concluded Parliament session. The Honourable Minister of State for Finance and one of the members of the Jury that selected the award winners, Shri Arjun Ram Meghwal too had arrived. The other two Jury members, who were also veteran Parliamentarians, were conspicuous by their absence due to exigencies. Soon after a brief tea-break, the Chief Guest, Justice (Retired) Shri P.Sathasivam, Honourable Governor of Kerala arrived on the dot to take his seat on the dais, with the Central Minister and the associated team members of the Sansad Ratna Team, led by Shri K.Srinivasan, popularly known as Prime Point Srinivasan. The session kickstarted with the National Anthem, followed by the welcome address by Shri K.Srinivasan, who spoke about the need for a proactive role of the civil society, and the innovative work Parliamentarians could do in their respective constituencies. Shri P. P.Chaudhary, Honourable Minister of State for Law & Justice, who could not make it to the event, compensated for his absence by sending across a video recording of his message for the occasion. This was played for the benefit of those present at the event. 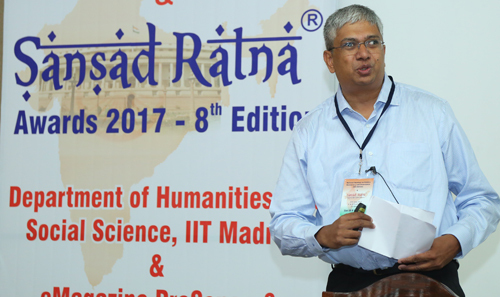 Prof Krishnan Balasubramanian, Dean of IIT Madras, which were co-partners with Prime Point Foundation and the ezine, PreSense, delivered the keynote address. He spoke of the role of IIT in participating in the nation’s economic development through projects with innovative technology that are economical and energy-saving. The presidential address was presented by the Honourable Minister, Shri Meghwal. In his speech, he lauded the high benchmark laid by the award-winning Parliamentarians and he made a special mention of the Parliamentarian recipients of the Jury’s Special “Sansad Ratna Award 2017”. He appreciated the quality of their performance in the Parliament. Shri Meghwal also dwelt on the pivotal and pioneering role of Prime Point Foundation under Shri K.Srinivasan, who translated an innovative idea into reality with the institution of the Sansad Ratna Awards. This session was selected for honouring Shri M.R.Madhavan as President of PRS Legislative Research for the outstanding work contributed by the institution to the Parliament, and to the civil society through its data collection, analysis and collation. He was awarded a citation by the Chief Guest. The Members of Parliament were then called to the stage individually to receive their respective citations. The awards were presented to them by the Chief Guest, the Honourable Governor. The achievements of the individual MPs were announced as each of them stepped forward onto the stage to receive the award. This was followed by a photo session of the MPs with the Governor and the Minister. The Chief Guest, Justice (Retd) Shri Sathasivam then took to the podium to deliver his inaugural address. He applauded the successful Parliamentarians. As the performing Parliamentarians were also evaluated by their utilisation of the funds under MPLADS (Members of Parliament Local Area Development Scheme), Shri Sathasivam shared the story of how the relevance of the scheme of MPLADS was deliberated upon by a panel of judges where he solely supported it and convinced the panel to approve the plan. At the conclusion of his address, the Chief Guest was presented a memento of books by Shri Meghwal. The session wound up with a Vote of Thanks by Dr S. Padmanabhan, Associate Professor, IIT Madras, and the National Anthem, before the Governor exited from the auditorium. The final one-hour session before lunch was an interactive session with the MPs, when the MPs answered questions about their special achievements in their respective constituencies. The session was moderated by Dr Bhawanesh Deora, Secretary, Sansad Ratna Awards Committee, Shri Ramesh Sethuraman, Additional Secretary of the Awards Committee. Shri V.Rajendran, member of PreSense Editorial Team, assisted in translation of Hindi to English to Hindi, where necessary. Shri Natarajan Raman of Dream India, an NGO associated with the education of government school children, and adults, was honoured with a citation for his outstanding social service, by the Honourable Minister. The morning session concluded with the presentation of mementos to the team and volunteers who worked for the event, and a photo session. The post-lunch session was a panel discussion on a topic of national relevance captioned “National Vision 2022 – Agriculture”. Susan Koshy, Editor, PreSense introduced the panel of speakers. The panel was chaired by Dr Anbumani Ramadoss, MP. The other panellists included Shri Rajendra Singh, activist and popularly known as the “Waterman of India”, Shri S.Ranganathan, General Secretary, Tamil Nadu Cauvery Delta Farmers’ Welfare Association, and Shri S.S.Rajasekar, Managing Trustee of National Agro Foundation. The salient points discussed were the relevance of traditional knowledge in crop cultivation, regulating the market to give the fair share to the farmer, and incorporating modern technology in the traditional process of agriculture to bring optimum yield to the advantage of farmers and the economy. The final session was the second panel discussion on “Tamil Nadu Vision 2022”. The panel was chaired by Dr Mariazeena Johnson, Pro-Chancellor, Sathyabama University. The other panellists were Shri R.Nataraj MLA, IPS (Retired) of the AIADMK Party, Shri PTR Palanivel Thiagarajan MLA (DMK) and Shri K.T.Raghavan, State Secretary of BJP. The panel was introduced by Shri R.Nurullah, Vice-President of the Sansad Ratna Awards Committee. The panellists deliberated on the inefficiency of the current bureaucratic system, and the lack of vision in the political system of the state. The extent of corruption was instrumental in most of the potential industries moving away from Tamil Nadu to other states. It was strongly endorsed by the panel that until and unless a genuine sense of patriotism is imbibed, there would always be a gap between vision and implementation of a progressive Tamil Nadu. The day’s event came to a conclusion with the National Anthem. The partners for the event were Sathyabama University and Canara Bank.. The video clippings of the entire proceeding are available at www.yutube.com/prpoint and also in www.sansadratna.in.